When a new dark threat rises from beneath, it may be beyond the limited resources she has left to deal with it… especially when she’s so alone. But is she ready to look to the Union for support? And is this something the Union can deal with? Or can only Elise, the Godslayer, take down this threat? And at what cost? I swear this series is my white whale. I read a book or two and then blink and S.M. Reine has written 8 squillion books in the same world and part of me thinks “no way can I catch up with them all” and then I’ll read another book in a different series and realise it’s in the same world and declare, that by Ahab’s ghost, I will tackle this whole series. I imagine a lot of people are going to be very put off by Elise on account that she is pretty much a deeply unpleasant person. And at times for me I was frustrated - not by her exactly but by the people around her - like why are you hanging around this woman? She’s made of terrible and awful! Anthony, James - put some distance between you and her! But I don’t dislike her. Her life has not been easy - including a lot of flashbacks this book which really bring home why she is called “the god killer” who she is, what her connection with the divine and infernal actually is and her rather terrible experiences because of it. We see her history and early days as a Kopis, and kopides with their high death rate and constant struggle against the various evils of the world. We see her own activities in the past with James when she was much younger hunting terrible monsters. And that isn’t lessened by the sometimes terrible things she has to do in this book coupled with just how utterly overwhelmed she is with the job of running Reno, protecting its inhabitants (including demons - which in itself is something that puts her at odds with not just other Kopides but even James as they can’t accept that chaos =/= evil) and protecting the holy gate. I also like the expanded world building here even though sometimes it can feel like a LOT and I am a little overwhelmed. There’s been a lot of times when reading the past books - or possibly because it has been a while since I’ve read the last book - where I’ve been kind of lost on the nature of what Elise is, how the divine and infernal interact et al. This does an excellent job of filling in a lot of the gaps, explaining Elise, explaining the main antagonists in a way that can be a lot at times, but is still very welcome. If I have an issue with this book it’s the odd sense of pacing. We have a big bad, a massive shadowy threat, and Elise feels just lost within it. She’s definitely opposing the Shadow but sometimes I think everything else in her life just builds up so much that the Shadow is lost, or just a litany of the many things in Elise’s life that she just can’t handle. I don’t think that’s necessarily a bad thing - but it does require you to slant your focus on the book. If you look at it as “defeating the world destroying evil in epic conflict” then it doesn’t entirely work. If you look at it as “the story of Elise who Just CAN’T any more but is still trying” then you’ve got something more accurate. It’s less “Elise combats the big bad with epic badassery” and more “Elise is barely holding it together and now THIS happens”. Which I think works really well with what is actually demanded from Elise towards the end of the book to actually stop the big bad. It’s hard - and if it’s epic, it’s only epic in the sense of martyrdom and for as much heroics as we see there’s also a great sense of descent, of losing herself piece by piece and generally collapsing under the weight of it all. There are odd sparks of hope but ultimately they fall apart and in many ways I identify heavily with James, forced to watch Elise collapse within herself from afar not knowing what to do to save her from her own self destruction. Diversitywise one thing we have to start with is that this is Elise’s story. Everyone is periphery to that. The most prominent secondary is probably James, but after that everyone else - Numa and Jericho the demons (who are nifty female characters - I kind of love Jericho and she earns Elise’s respect), Anthony (who is latino) and the Union (some of which are POC) all kind of fade into the background because this is, ultimately, Elise’s story. Elise herself is intersex but this is only known from previous books and not mentioned in this one. 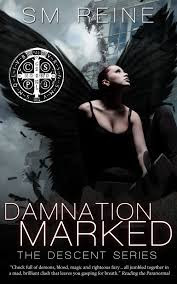 This is definitely one of the darker books in the series - but from the very depth where this book ends, we open up a myriad of new possibilities and potentials for the next entry in the series - I look forward to seeing where this goes from here.